Derailed trains, screaming passengers and a collapsed building – all elaborate props in Europe’s largest emergency simulation exercise held in Kent on Monday. The staged scenario wascarried out to prepare Britain’s emergency services for a potential large-scale operation. The £800,000, four-day Exercise Unified Response was coordinated by the London Fire Brigade and funded by the European Union. 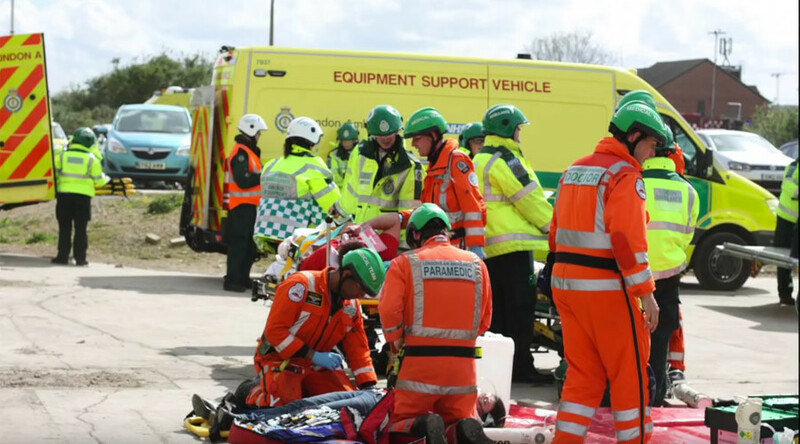 Some 4,000 people took part in the exercise, including 1,000 actors who played injured or killed rail users. Although the exercise was made up to look like Waterloo Station in London, the staged catastrophe actually took place near Dartford. An entire tube station was recreated for the drill and then “destroyed” in a disused power station to recreate a tower block collapsing into a station. Emergency services worked alongside more than 70 partner agencies for the exercise, including local councils, utility companies and specialist search and rescue teams. Disaster victim identification (DVI) teams from around the UK also joined the operation alongside forensic specialists. “We needed to create a realistic scenario, there’s hundreds of thousands of tons of rubble. “The idea is there’s been the collapse of a high-rise building above Waterloo station that’s gone down into the station itself [and] caused some collapse in the tunnels, there are some Underground trains caught up in it and people trapped. “There’s lot of other hazards down there we need to be careful of,” he added. Participants in the exercise, which continues until Thursday, said the drill was a success on social media. Chief Constable Debbie Simpson, of the National Police Chiefs, said it’s rare to test emergency services on such a large scale. “Victim identification is never a pleasant subject to discuss but it is unfortunately a reality. When disaster strikes families need to be confident that the authorities are doing everything they can to identify their loved ones in a dignified and respectful way, whilst supporting any criminal investigation,” she said. “Importantly this process cannot be hurried. As frustrating as this can sometimes be, especially in a world of fast paced mainstream and social media, we have to be meticulous in our approach to ensure we achieve reliable scientific identification.